These four logos were designed for ICON Technologies, providing a unique mark for the various services offered by the company while maintaining a visual connection with their company logo. It was clear that the strongest element of their main logo is the orange "swirl", so it made the most sense to carry that element into the new logos. 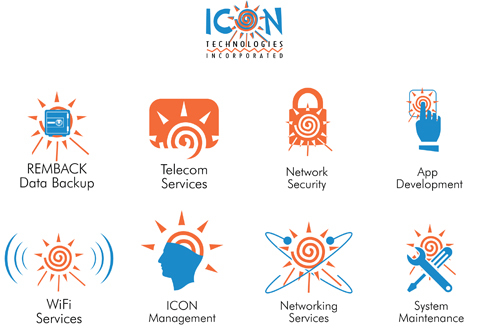 The logos above are used to promote ICON's WiFi, Telecom, Network Security, Data Backup, and Networking services. The ICON Management logo is an internal identity, used for the company business and project management.